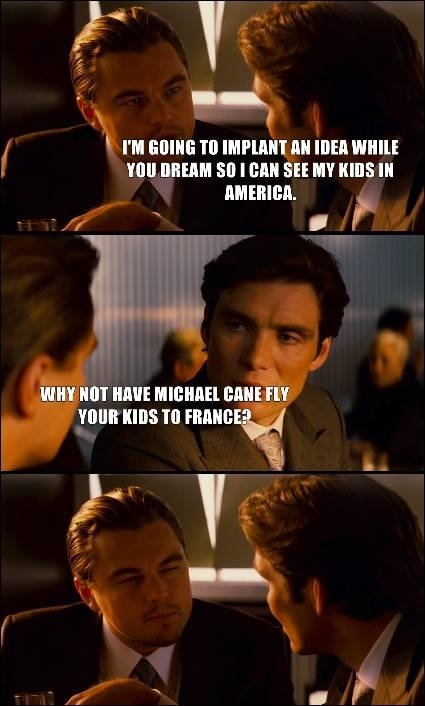 So, we were a little late to the party in the first place, since we didn’t see Inception until a couple of weeks ago. Just the same, this made me laugh. A lot. 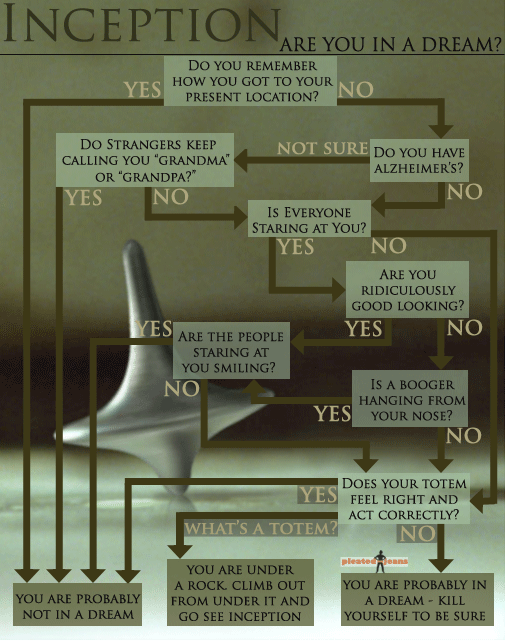 BONUS FLOWCHART: Are you in a dream? 1. Are there two or more women in it, and do they have names? 3. Do they talk to each other about things other than men? I had never even heard of this movie before it appeared in our mailbox via Netflix. “Did you put this one on the list?” I asked my husband. “I don’t remember hearing of it before.” He replied, “Oh, ¿ya llegó? Great!” He excitedly began to describe the movie, that it had one of the longest and most violent fight scenes ever, that it was Viggo Mortensen, that it was supposed to be an excellent film. I was extremely skeptical, and assumed it would be a typical “guy movie:” violent, bloody, empty and predictable. We settled in to watch, and after the first five minutes (and the first grisly and bloody throat-slitting), I was convinced my assumption was spot-on. However, I actually got really drawn in – it turned out to be a pretty good movie. I was surprised to see some interesting history and some character development, and although we had Viggo figured out from pretty early on, we enjoyed the entire film. Our only groaner moment: the gratuitous romantic kiss towards the end – irrelevant, not very believable and WAY cheesy). 4/5 eye-rolls. About an hour into the movie I realized I was getting a headache, pretty unusual for me…I chalked it up to being a bit dehydrated since hadn’t been drinking as much water recently. I filled up my water bottle and settled in to drink up. As the movie went on, my headache got worse, and once the film was over, I chugged more water and headed up to bed. About 2am, I was awakened by a throbbing, vice-like pain. The back of my head felt so tight, I thought I was somehow squeezing my brain out of my ears. I felt like I had ice picks shoved into each eye, and as each minute passed, the pain got worse. I finally woke poor F and asked him to go downstairs for some Advil, which I took. I was miserable, nearly in tears, and I tried rubbing my temples and forehead, trying to massage around the base of my neck. What is going on? I thought. Could I be having a stroke? Sima said she had a terrible headache when she had her stroke… I felt worried–This was the worst headache I’d ever had in my life. I switched tactics and tried stretching out my neck and shoulders, which I found were super tight. At that discovery, I found myself thinking back to the movie, and how I cringed at the “fingers” scene, and how that after the bathhouse fight was over I’d found myself crammed into the farthest corner of the sofa. Perhaps just a real booger of a tension headache from cringing my way through the film? I ended up going downstairs for the specific reason of lying my face on the leather sofa, which felt cool and soothing. After about 25 minutes or so, the pain began to abate a bit…and finally, the vice loosened. When I found myself dozing off, I went back upstairs to bed and finally fell back asleep until the next morning. Eso sí, I dreamed of cutting off people’s fingers, and renting a room in a Russian mafia house, and other icky and creepy scenes, and woke up with the headache threatening to return. I took three more Advil as soon as I got up, and had a medium-heavy breakfast to try and mitigate the worst stomach-destroying aspects of the ibuprofen. For now, I’m vertical at least. In spite of all this, I still recommend the movie. Check it out!